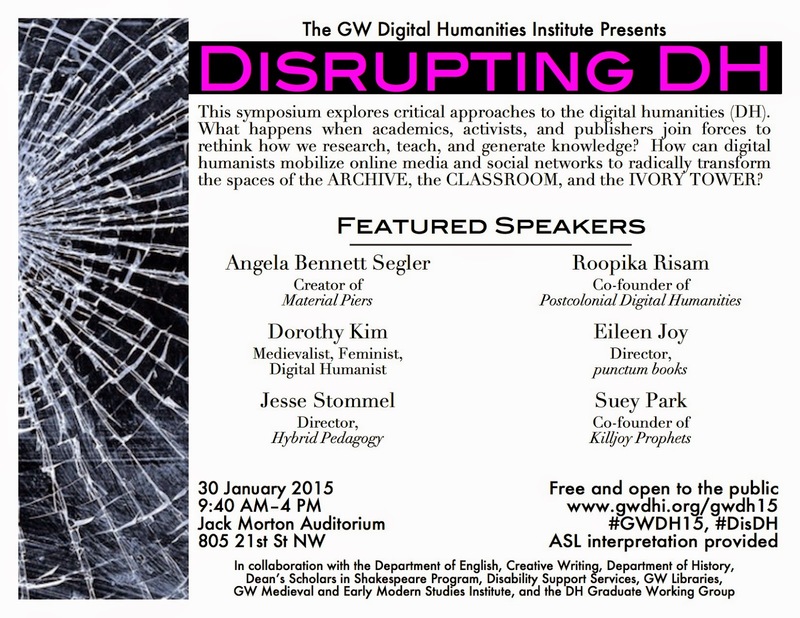 GW Digital Humanities Symposium 2015: DISRUPTING DH (poster by Shyama Rajendran). 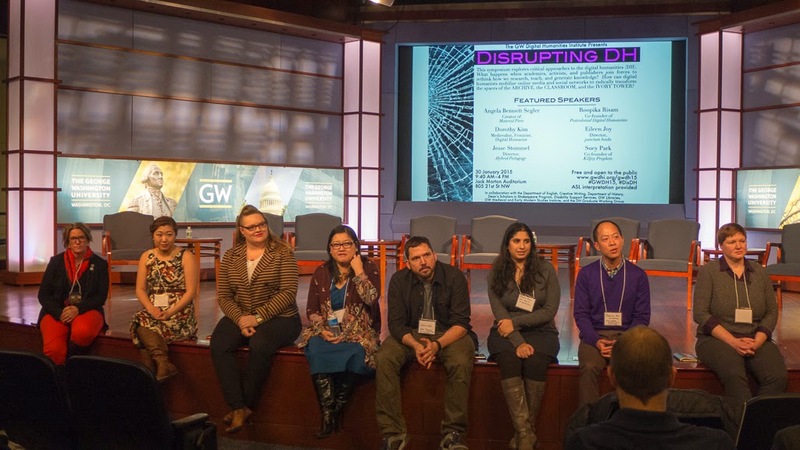 Dear ITM readers: It has been a while since I wrote one of my “post-conference blog posts,” and here I’d like to offer my reflections on DISRUPTING DH: a symposium held on January 30 and organized by the GW Digital Humanities Institute, in coordination with many units/programs across George Washington University. 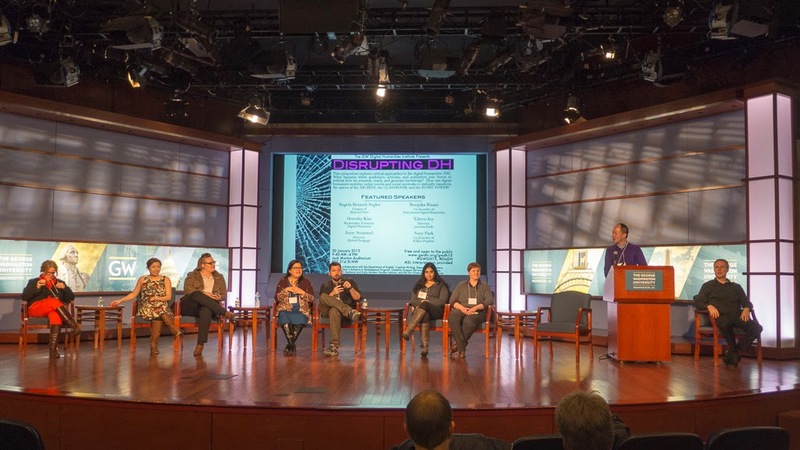 This event brought together activists, students, publishers, members of the public, academics, and librarians to think critically about how communities create and use digital archives and other online media. Enacting a “big tent” vision of Digital Humanities (DH), we invited speakers and participants varied in rank, gender, and background (activists, academics, grad students, para-ac and alt-ac folks) and the day as a whole deliberately centered women and people of color (including participants who in other contexts identify as queer or are involved in LGBT communities). We gave no proscriptive directions to our speakers and varied modes of presentation emerged: everything from scripted papers (with or without slideshows) to more extemporaneous remarks. Some presenters have already made their materials public (links provided throughout this posting), and the event had an active twitter presence with an engaged audience well beyond the auditorium. Note for instance this impressive archive of #GWDH15 and #DisDH tweets gathered by @alothian (Alexis Lothian) and a curated collection of tweets by @transliterature (M.W. Bychowski). Our invited speakers included medievalists who are no doubt quite familiar to this blog’s readers: ITM’s own Eileen Joy (director, punctum books), Dorothy Kim (author of some of the most widely read/shared/retweeted postings on this blog! ), and Angela Bennett Segler (creator of Material Piers). Non-medievalists included Jesse Stommel (Founder, Hybrid Pedagogy), Roopika Risam (Co-Founder, Postcolonial Digital Humanities), and Suey Park (Co-Founder, Feminist Killjoys). The event also follows a recent MLA session on Disrupting the Digital Humanities with a related collection (edited by Kim and Stommel) forthcoming from punctum books. The day’s events began with an overarching question: how can different kinds of people come together to transform the spaces of the ARCHIVE, CLASSROOM, and IVORY TOWER? In my own opening remarks (with my hat on as Co-Director of the DH Institute), I echoed Dorothy and Jesse’s call to reclaim “disruption” from its (over)use in corporate culture and Silicon Valley tech circles, and I maintain that we can be observant critics of discomforting spaces that surround us. I mentioned, for instance, my own unease with the histories of locations on my own campus: a dorm formerly named “Ivory Tower,” and a performance venue that was once racially segregated. In my view, digital archives and platforms offer an opportunity to both confront the histories of such spaces and shape new kinds of open communities. Bennett Segler and Kim set the tone for the rest of the day by grounding the disruption of DH in social justice, the invisible labor and exploitation of women, people of color, and other under-paid, under-publicized radical librarians who have been leaders in the movement to digital archives but have since been erased as institutions, directors and users who recode these projects as typically white male spaces. This is perhaps not surprising, notes Bennett Segler, “today’s revolution is tomorrow's institution” but this domesticating of women of color's digital labor can be resisted. Kim added that by refusing to see archives as a politically “neutral space” of universal access we can redirect social and financial capital back towards the exploited and forgotten progenitors who continue to revolutionize the field and disrupt the digital humanities. CLASSROOM. This session turned to digital pedagogy and public humanities. Jesse Stommel’s “Stand and Unfold Yourself: MOOCs, Networked Learning, and the Digital Humanities” offered a preview of a MOOC (Massive Open Online Course) on “Shakespeare in Community.” This endeavor seeks to “invert” the MOOC by not thinking along the lines of a “sage on the stage” (one professor, bazillion students) but rather setting the stage for dispersed authority (expertise arising from varied experiences of students, actors, poets, academics, enthusiasts). A clear point from Jesse’s talk was that we must not police the boundaries of “what counts” as DH. 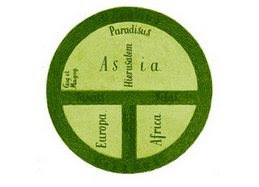 Roopika Risam’s “Toward a Postcolonial Digital Pedagogy” considered how even more conventional classrooms can also crowdsource knowledge (her example was students creating on online map-based Cultural Atlas of Global Blackness). While the content and presentation styles in this session were quite distinct, a few shared themes emerged. Both speakers agreed that teaching can mean abdicating your own authority and letting expertise emerge from students, and discomfort (on the part of the teacher and students alike) can be a productive pedagogical tool. IVORY TOWER. The final pairing of the day included Eileen Joy who offered a forceful case for “The Importance of Illegitimacy.” In her artfully stylized talk, Eileen reflected on the need for independent “out-stitutions” and publishers (including open access venues) that can create new forums and new intellectual publics. In making a call to change a culture of authority into a shared ethics of care, her talk anticipated an intimate presentation by Suey Park. In “Theorizing Transformative Justice in a Digital Era,” Park not only revealed how activist communities can themselves engage in behavior that is bullying, controlling, or abusive; she also worked through racialized language of "toxicity" that has been used to describe activists and women of color on twitter, and she stressed the need to create online communities whose members safeguard each other and foster transformative (rather than reparative) justice. One of the most intriguing aspects of this pairing of speakers was how both talks revealed the intertwining potential of creation and destruction. In her remarks introducing Suey, my wonderful colleague and poet Jennifer Chang likened Park to a lyric poet, observing that tweets are an expressive and constrained form—beautiful, and dangerous. The concluding roundtable including all the presenters was co-moderated by me and Lori Brister, founder of the DH Graduate Working Group at GW. The discussion quickly reoriented itself toward students (especially graduate students being cultivated as the “future” of the profession), considering the structural inequalities and constraints many DH folks can face. How do we remain committed to our various causes or “labors of love,” and how do we also address the realities of uncompensated labor or inequalities inherent in our various spaces? Conclusion of #GWDH15: roundtable participants conversing with audience. Although I had to miss the presentations by Jesse Stommel and Roopika Risam, it was a pleasure to see Stommel lead the collective of speakers out of their chairs during the roundtable discussion and onto the edge of the stage, thereby breaking the fourth wall that marked their bodies as authoritative and their space as exclusive. This act evidenced a real commitment to the democratization of information that each of the speakers desires, as well as the group’s willingness to relinquish the power granted them by the Academy – at least temporarily. Sure, the act was rather symbolic, but it was a risk nonetheless, and one which underscores the precariousness of our field and the digital humanities as a sub-discipline. One of the aspects of #GWDH15 that will stick with me for some time were its moments of disturbance and discomfort. In the discussions that have unfolded in person and online (note JEFFREY’s public Facebook thread, for instance), I’ve been thinking a lot about how “breaking the fourth wall” (via blogging, tweeting, or otherwise putting oneself “out there” through publication or presentations) can be an empowering experience—but it can also make a person vulnerable. I do hope that our medievalist/academic/etc. spaces will increasingly become ones where we all feel safe and can be more adventurous. The call for sessions at the next BABEL gathering (“Off the Books” in Toronto in October) has been extended to February 15, and the New Chaucer Society (NCS) Congress in London 2016 is now accepting submissions by April 15—and it’s very exciting to note that NCS includes some bold, risky options. As the ITM community thinks ahead to these events, I hope we can all be more mindful of “divergent bodies” (to use Dorothy Kim’s coinage) moving through our professional / personal / public / digital environments. 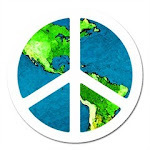 How can we be the change we want to see in the world? I’m so very gratified that ITM has become a venue not only for talking about “medieval things” but also a way to provoke attentive, earnest conversations about what it means to be in medias res (“in the middle of things”)—to live with others in real life and also in variously mediated digital spheres. If I can end this blog post with my own “call to action,” I’d just say this: let’s try to take more risks with how we think about our materials, experiment with writing styles and presentation formats, and carefully consider how we perform in our shared spaces. 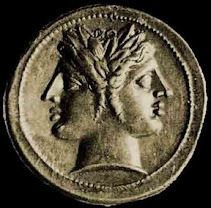 If you’re in a position of power (tenured professor, administrator, mentor, advisor, trustee, benefactor, journal editor, chair, peer reviewer, hiring committee member, the list goes on), support and defend people who take risks and chart different paths. Let’s create conditions where we can move out of our comfort zones and re-code what it means to work in/alongside/outside of humanist communities. For a summary of events note M.W. Bychowski’s overview on the GW English blog (with other links) and a more detailed summary on her Transliterature blog. Katie Walter and I are co-organizing the “Corporealities” thread at NCS which includes a number of great collaborative endeavors.